Sir Louis Matheson Distinguished Visiting Professor, Faculty of Business and Economics, Monash University, Melbourne. 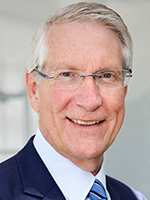 Professor Gordon L Clark DSc (Oxon) FBA was Director of the Smith School of Enterprise and the Environment from 2013 to 2018. He continues as a Senior Consultant and Emeritus Professor at the Smith School of Enterprise and the Environment, with cross-appointments in the Saïd Business School and the School of Geography and the Environment at Oxford University. He holds a Professorial Fellowship at St Edmund Hall, Oxford. He is as well, Sir Louis Matheson Distinguished Visiting Professor at Monash University's Faculty of Business and Economics (Melbourne) and a Visiting Professor at Stanford University. Previous academic appointments have been at Harvard's Kennedy School of Government, Harvard Law School (Senior Research Associate), the University of Chicago, Carnegie Mellon's Heinz School and Monash University. Other honours include being Andrew Mellon Fellow at the US National Academy of Sciences and Visiting Scholar Deutscher Akademischer Austausch Dienst at the University of Marburg. He has held a number of senior administrative posts including Associate Dean (Finance, Graduate Studies) and Dean of the Faculty of Arts at Monash University (Melbourne), Chair of the Faculty Board of Anthropology and Geography (Oxford), and most recently Director and Head of the Oxford University Centre for the Environment. Professor Clark has served on the Social Science Committee of the British Academy, has been an elected member of the Oxford University's Socially Responsible Investment Committee, is an employer-nominated trustee of the Oxford Staff Pension Scheme, is a consultant to MetallRente GmbH, is a Founding Governor of the UK Pension Policy Institute, is the External Advisor to Diageo's Executive Environmental Working Group, and serves on the advisory board of Arabesque. He was a consultant to the Swedish Government's Buffer-fund inquiry, and advised The Kay Review on Equity Markets and Long-Term Decision Making. He is currently advising the Australian Fraser Review of pension fund governance. An economic geographer, he is interested in the responsibilities and behaviour of investors as regards long-term sustainable investment. This has involved research on institutions' proxy-voting behaviour, the strategies of corporate engagement given concerns about environmental liabilities and the sensitivity of firms to brand image and reputation, the regulation of corporate disclosure on issues related to environment and social responsibility, and the governance of investment institutions that have an explicit long-term mandate. His current research focuses upon the governance of investment decision-making in the context of market volatility and long-term obligations. In part, this project has developed in collaboration with Oxford colleagues and graduate students as well as the PRI, Mercer, the Telos Project, Towers Watson, and the project led by Professor Tessa Hebb at Carleton University (Ottawa) funded by the Social Science and Humanities Research Council of Canada. Recent related books include the co-edited Managing Financial Risks: From the Global to the Local (OUP 2009) (with Ashby Monk and Adam Dixon), and The Geography of Finance (OUP 2007) (with Dariusz Wójcik). 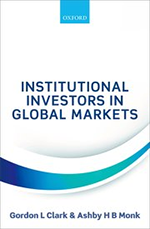 Related research is focused on the design and management of investment institutions including reference to insourcing, out-sourcing, and off-shoring activities and the demand and supply of financial services relevant to pension funds, endowments, and sovereign wealth funds. Papers on this topic have been published in the Journal of Economic Geography (2013), Environment and Planning A (2014), and Place, Territory and Governance (2014). With Adam Dixon and Ashby Monk, his monograph on the governance and legitimacy of sovereign wealth funds was published by Princeton University Press in 2013. His new book on the organization and management of financial institutions with Ashby Monk will be published by OUP in 2017. His research on household financial decision-making has focused on long-term saving utilising theories and methods from the behavioural and social sciences in the context of risk and uncertainty. Papers on this topic have been published in the Transactions IBG (2007), Ageing and Society (2008), Environment and Planning A (2009), Pensions: An International Journal (2009), the Journal of Economic Geography (2010) and Urban Studies (2011) supported, in part, by the ESRC, Mercer and Towers Wyatt. With Kendra Strauss and Janelle Knox-Hayes, he is co-author of Saving for Retirement (OUP, 2012). His latest research utilising a large data base of more than 550,000 pension plan participants over 10 years in conjunction with the Monash-CSIRO project. Recent papers available on ssrn.com deal with gambling behaviour, advice-seeking, and decision-making.